Only one photo tagged with Whitemare Pool. If you have one, why not upload it? A former Little Chef restaurant at the roundabout on the outskirts of Newcastle. The former Little Chef building, now home to familiar roadside brands. Shell operate the filling station. This site is the former home of the Whitemare Pool branch of Little ChefHistory which closed as part of R Capital's closures in 2012. The site remained as a Burger King only site until 2014 when a Subway filled the former Little Chef restaurant. 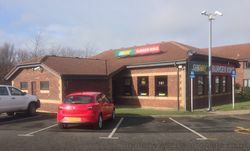 Both units underwent refurbishment by now owners Euro Garages in late 2018 and reopened with the addition of a Greggs store in January 2019.